And it came to pass, that, as he was praying in a certain place, when he ceased, one of his disciples said unto him, Lord, teach us to pray, as Justin also taught his disciples. More HERE, and journalistic summary HERE. Some will find in this nothing but spiritual shallowness and theological frippery. It’s easier to carp and criticise than to pray and love. This is the Archbishop of Canterbury – the ‘Vicar of England’, as some vaguely know him – answering the people’s questions about prayer. It isn’t a grandiose biblical exposition; it isn’t a systematic theology: it isn’t theology at all. It is ministry, service, mission, charism. It is about community, accessibility, intimacy and enlightenment. Justin Welby gives guidance from experience, bringing to bear the problems of the world and a myriad of individual needs, wants and puzzlements. It’s raw and rough at the edges, and all the better for it. Some might call it ‘authentic’. The questions were multidimensional: he could have spent an hour on each, but he had only 30 seconds to clarify a thought and inject some truth or insight. 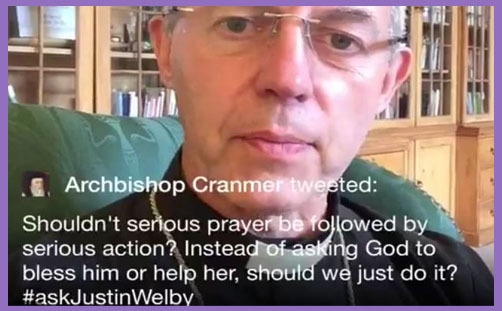 We are left with an impression that, for Justin Welby, prayer is the life of faith: he is committed to it. When we express ourselves verbally to God, something changes – more often, us. Yes, there is silent prayer, but silence is sometimes the loudest discourse of all. There is nothing which cannot and does not fall within and beneath the domain of prayer, but it is more than wanting, yearning, beseeching. It is communion between God and man: openness, nakedness, vulnerability, revelation. We might do the speaking, but God moves us to pray in the depths of our being. We can always find an excuse to ignore the promptings of the Holy Spirit, but such evasion brings nothing but drought. We can persuade ourselves that it’s all a waste of time – the sick aren’t healed; the starving die; wars still rage – but prayer isn’t magic; intercession and petition aren’t spells. Prayer doesn’t manipulate God: it moves us to a place where our egos whither away in the perfect judgment of His holiness. Listen, and hear very carefully. You might even learn that your motives are mixed, and all that you write and speak about truth and justice and rights and freedom is nothing but your personal interest and selfish desire. Prayers for peace are worthless when the craving is just to mitigate personal inconvenience. Prayers for justice are meaningless when the objective is psychological affirmation or career progression. You can’t bend God’s will to your own, so let Him nudge you a little more toward loving human society with the mind of Christ. You can’t easily do that alone: it’s a community pursuit, and being in submission to others’ wisdom is the best guard against egocentric aberrations and infallible insights. And if that dynamic community now gathers on Twitter, perched tentatively between liturgy and spontaneity, then that’s where the Archbishop of Canterbury must be. It is ‘applied theology’ – diverse, flexible and messy, but authentic, in spirit and in truth.